Get started with these tips & techniques for cooking chicken. Learn more. Lisa and John Kennedy share their first-hand experience as BC Chicken Farmers. 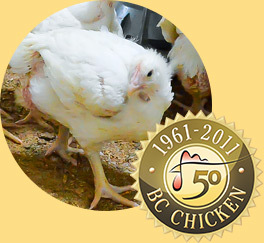 Learn more about specialty asian chicken grown right here in BC! The British Columbia Chicken Marketing Board (BCCMB) is a non-profit organization that monitors and regulates the production and marketing of chicken in British Columbia. The BCCMB was created under the Natural Products Marketing (BC) Act in 1961.